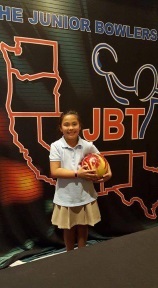 31 opponents at the JBT Tournament held at the Texas Station in Las Vegas LAST Saturday. February 13th and competed in the age group 21 and under. 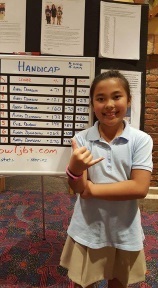 Avery entered the tournament with a 112 average with a 79 handicap. She had to bowl five games of qualifying. She took the lead for the first 4 games and Kyle Rendon took the lead after game 5. Avery was #2 going into the semifinals with a +207. She took over 1st place after the first game in the semifinals and never looked back! place finish after qualifying in the semi's. Congratulations to Avery on her excellent outing and representing the community of Imperial Beach. We are all very proud of you. 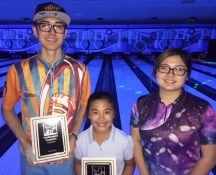 Avery Domaguin proved once again it's "any age, any average" at JBT, while Cortez Schenck proved once again it's "any center, any format" for him, in winning JBT titles in Mojave Conference action at Texas Station. Nick Pollak began the scratch division stepladder finals with a 234-211 win over KJ Martinez when KJ couldn't get the five strikes needed in the 'endless tenth' format to catch up. Pollak then defeated Eric Hatchett in a thrilling 255-247 endless tenth matchup that went back and forth for three shots. Ryan Lee then advanced to the title match in his first singles finals appearance with a 227-183 win over Pollak. Top seed Schenck led seven of the eight rounds to lap the field, but no lead is safe in endless tenth, and a short fill count froze his score at 254. Lee did get the extra tenth, and got two of the five strikes he needed to tie, but when the third attempt failed, Schenck claimed the 254-224 final, and the 67th title of his JBT career. Evrin Peacha began the handicap division stepladder finals with a 216-203 win over Dominic Olivares. Peacha then got past Samantha Conti 236-214. In the semifinals, Kyle Rendon beat Peacha 223-195 to move on to the title match. Rendon and top seeded 8 year-old Avery Domaguin were by far the 1-2 players on the day, so it was appropriate that they played for the title. However, Domaguin showed poise and talent way beyond her years, winning the title match scratch, and 252-204 after handicap was added in, for the first JBT title of her career. Every girl named Rachel (or Rachael) made the girls' title match, and in the finale, it was Rachel Csanyi beating Rachael Berg 192-159 for her first girls title of the season. Thanks as always to Jerry Francomano and his terrific team at Texas for hosting it. Want in on the fun for all ages and skill levels? Just come on down to the next JBT event!